In today’s highly charged political arena erroneous claims are made, using terms like ‘First People’ and/or alternatively ‘First Nation’, that bear little credibility to the facts about who the ‘First People’ are in the South African context and more broadly indeed in Africa. When we talk about “First People” without any political baggage then we can only mean the emergence of Homo Sapiens (humans) on the continent. Anatomically modern humans evolved from the archaic humans in the Middle Palaeolithic period about 200,000 years ago in Africa, marking the dawn of the subspecies Homo Sapiens, who are our ancestors. Archaeological discoveries of archaic humans should not be conflated with that of modern humans. Behar, Soodyall and the Genographic Consortium tell us that in dna terms the forebears of those we refer to as the San have matrilineal ancestry which diverged from the rest of the human mtDNA pool sometime around 90,000 years ago in East Africa and that parallel to this there were also at least five other matrilineal lineages arising out of the “First People”. The Genographic Consortium also establish that an estimated minimum of 40 other evolutionarily successful lineages ﬂourished in sub-Saharan Africa as well during the period of modern human dispersal 60,000 –70,000 years ago. About 70,000 years ago the forebears of the San would have entered South Africa. They further say that only much later, at the beginning of the Late Stone Age, about 40,000 years ago did introgression of additional lineages occur into the San mtDNA pool and that these processes were further accelerated when other East African, (& Nilotic) and Bantu dna entered the mix during the periods of different East African and siNtu (Bantu) engagements on the periphery of the Kalahari from around 2,500 years ago. This is when the Khoena (Khoi) first emerged with strong dna shared with the same forebears of the San but also with other dna markers. The Khoena would also take on further dna markers as they later came into further contact with siNtu speakers around 600AD in the Eastern Cape and siNtu speakers would take on dna markers of the Khoena and San too. Humans and apes are said to have common ancestry relatively in the Miocene period around 8-million years ago. Early ancestors of archaic humans can be traced back in various parts of the world from before 2,5 million years ago through markers that they left behind. We often hear people make sweeping claims that their ancestors occupied the land for millions of years or hundreds of thousands of years, but such statements are not rooted in fact and we must distinguish between early ancestors in human evolution- archaic humans and Homo Sapiens (humans as we know ourselves to be). The first Homo Sapien ancestors (Humans) began spreading from East Africa and were what can be called the ‘FIRST PEOPLE’, about 200,000 years ago and the ‘first division’ of ancestry, into which the San and others fall, emerge about 90,000 years ago. Around 80,000 years ago a small group of Homo Sapiens also left East Africa and moved through the Horn of Africa to populate the rest of the world through a slow migratory drift. Some of these also returned back into Africa over different periods of time. Homo Sapiens of the ‘first division’ of ancestry, into which the San falls, can be shown through archaeological evidence to have moved into southern Africa around 70,000 years ago. San populations from northern Namibia and Angola separated from the San populations in South Africa as early as 25,000 – 40,000 years ago and the Khoena pastoralists only emerged from the Southern Namibian and South African San 2,500 years ago showing small but distinct markers of East African and Nilotic dna markers going back first to East Africa and then to the Middle East and this was just a few hundred years prior to the first of the different waves of Bantu migration. The Bantu migrations were not “invasions” or “colonisation” as sometimes alleged, but rather a slow migratory drift over a very long period not too different from that of the Khoena across South Africa. The South Africa San from around 12,000 years ago (and the later Khoena pastoralists about 500BC) had a great diversity of peoples that fell under these catchall terms. Studies of the movement of sheep from Southern Arabia and North Africa to end up being farmed by Khoena also attests to an East African, North African and even Middle Eastern connection to some San and to the Khoena in particular. There are also markers in both the San and Khoena of post Bantu migration dna which evidence genetic mixing with Bantu. All of this shows that the ancient background to the Khoena is a lot more complex than previously projected and popularly believed. The entire humanity shares connections to the “FIRST PEOPLE” (the widespread Homo Sapiens that spread across Africa 70 000 years ago) and, this includes those who later emerged to become the San and the Khoena. The puzzle that has consumed researchers concerns the WHEN and HOW and WHERE that the groups whom researchers collectively called Khoena (Khoi/Khoe) emerged. It is accepted that in great measure there is an ancient sharing of dna linkages to the San, but that in smaller measure there are also markers of other groups in Khoena dna prior to Bantu migration and prior to modern era mixing. Scholars who have applied their minds to this subject are archaeologists, linguists, ethnologists, geneticists, physical anthropologists and social historians, and have published a number of studies in this regard. In recent times these social scientists and scientists have worked more closely together than before and particularly with the advances in genetics, more and more evidence is emerging that clearly shows that the San may have not been as isolated from other influences than previously thought. The Khoena particularly were certainly were exposed to other dna contributions. Lots of new indicators are constantly emerging. For instance in 2014 Dr Carina Schlebusch, a foremost geneticist, found in her studies a hard Khoena link to East Africa that points to a journey from East Africa over 2000 years ago by following milk markers in the Khoena dna – Allele LP-SNP 14010G. An open mind has to be maintained when exploring our past. Political interests have also stood and hovered over these studies eager to latch onto anything that may give their political claims more credibility. One must be careful not to be led by political opportunism. It is important that one treats all claims with a degree of questioning and rather look at ALL information available without hastily jumping to conclusions. It is not necessary to argue ‘race purity’, ‘first people’ nor ‘first nation’ to establish the important indisputable fact of ‘first habitat’ at the time of colonialism and the devastation that colonialism caused to indigene peoples. ‘First Habitat’ and being an ‘Indigenous People’ (Indigenes) is also not exclusivist and in different parts of South Africa it has different meaning. The sharing of indigenous roots for at least the last 1700 years between various peoples indigenous to the African continent is a social history and genetic reality too. Acknowledgement of these facts in no way weakens the argument of dispossession by the most marginalised and discriminated against indigenous peoples. In my opinion it actually strengthens the arguments for redress. Political terminology does not assist when dealing sensitively with the complexity of human development in Africa (or anywhere for that matter). The political term ‘First Nation’ is a purely based on the modern European political term – NATION, relating to the emergence of post-feudal ‘Nation-States’ in Europe in modern history and bears no relationship whatsoever to indigenous peoples of Southern Africa. It actually is a colonial term. Archaeological and DNA studies are constantly providing new evidence, and as a result, new perspectives and schools of thought often arise concerning the origins of the Khoena people of South Africa. But the one thing that is agreed is that events of catalytic importance happened around 2,200 – 2,500 years ago in the region of the Kalahari and it’s perimeter (also called the Northwest Circle) in Southern Africa whereby one branch of the San were engaged by external forces from East Africa with older links to North Africa and beyond which gave birth to the Khoena of the Kalahari and perimeter. The Khoena as a social formation first emerged in the Northwest circle of Namibia, Botswana, Zimbabwe and Limpopo with the Kalahari as epicentre then migrated southwards in three stages – first to the Gariep and Southern Namibia and then to the Eastern Cape and then to the Western Cape. Along this route they also mixed with other groups – among these Bantu and Cape San. This migration trajectory is how the Cape Khoena as a people evolved over a thousand year period. For over a century two schools of thought (with many variations within each) have dominated among those studying the Khoena. Then in recent times these came together in consensus and but then even more recently the consensus revisited with new facts leaned toward the one school of thought, particularly based on important new genetic information. Debates will continue but from the genetics arena fairly hard evidence has emerged to support the “out of East Africa, North Africa and beyond” school of evidence. This was addressed earlier in this story. Essentially in a simplified form, the DNA evidence shows that the events that gave birth to the Khoena in the Kalahari and its perimeter was a coming together of San adopting pastoral influences around 2,200 – 2,500 years ago in that region with migrants from East Africa. These migrants had migrated southwards sometime between 2,800 and 2,500 years ago and who in turn had roots further back in Ethiopia and Southern Arabia 3000 years before that time (6000 years ago). Conclusive evidence has been provided to show that the Khoena in South Africa have West Eurasian dna along with Southern African (San) dna. The Khoena are shown that in addition to San dna to also have strong traces of Nilotic dna and Bantu dna and some Hadza/Sandawe dna all showing a mixture of roots along a migratory route. The notion of absolutely separated races or ethnicities (the notion of purity) is not borne out by dna scrutiny. So the Khoena are a relatively new development born among some of San who were genetically mixed with new migrants and who engaged in a new pastoral mode of living and economy. Thus migrants along a trajectory from North Africa to East Africa to South Africa, mixing along the way over a long period and bringing sheep and cattle, at a particular point, engaged with the San and later in different epochs with Bantu on the edges of the Kalahari. From this mix a new pastoral community of Khoena came about in the Kalahari and over 200 more years began to drift further South to the Gariep. From the Gariep over another 600 years some of the Gariep Khoena drifted down to the Eastern Cape on a trajectory to the Western Cape, while others drifted down the West Coast similarly. In the Eastern Cape the Khoena for a second time engaged with Bantu and also again engaged with dispersed San. The complexities and the depth of highly developed African societies with social histories that interface with South Africa are now also coming to light after a long period of suppression by Christo-European intellectual hegemony, responsible for the destruction of African civilisations and, for papering over huge elements of a challenging African past. The evolution of Khoena social history over this migration requires much more collection of evidence and research. For instance the interaction between the Khoena and the old African centres of trade and development at Great Zimbabwe and Mapangubwe, or with the fascinating Lembe (South Africa’s black Jews) would be interesting to explore. The gaps in social history must be explored and a challenge exists around notions of ‘primitivism’ and the European concept of ‘the noble savage’ which has strongly been overlaid on Khoena society and unfortunately has been adopted by some elements who then lock Khoena culture in a time capsule. This when linked to skewed histories based in what I call the ‘Great Lie’ distort the entire San and Khoena story. Richard Elphick gives us just a small glimpse of Khoena trading links in pre-colonial times with trade routes stretching up to East and Northern Africa and indeed they were not an isolated ‘primitive’ group in South Africa, without linkages to an ‘outside’ world. By about 300 AD the Khoena through a process of multiplication by division spread through the Eastern Cape forming a number of tribes, one of the first of which was the Cobona or Chobuqua who were integrated with those whom the Khoena and San called the Xhosa, the earliest of siNtu speakers in the region. The language and customs of the Xhosa reflected the strong San and Khoena influences and integration. Senior Xhosa leaders preferred Khoena and San wives, a tradition that continued over the centuries. The great Makhanda’s mother for instance as late as in the 18th century was a Khoena diviner and Makhanda himself (in the 19th century) was married to Khoena leader Hans Trompetter’s sister. In the slow migratory drifts that brought Khoena, San and siNtu speakers together in the Eastern Cape there is no evidence at that time of any major threat by one on the other. The siNtu speakers were much smaller in numbers and not very powerful. Both the Khoena and San left a major mark on these people that they called Xhosas – ‘the angry ones’. Centuries later with later Nguni influences brought to bear by the Thembu, Mpondo and Mpondomise both the Cobuqua and the Xhosa came under Nguni influence. Numerically the Khoena by far were more numerous than the Xhosa in the Southeastern Cape but they lived together largely in peace. The later Nguni trickle grew and grew and asserted hegemony particularly over the Xhosa. Both groups were pastoralist and over time the nature of pastoralism resulted in frictions with hunter gatherers, the San, who retreated into the mountainous regions of Bruintjies Hoogte, the Sneeuberg, Roggeveld and beyond. Here the San established a formidable presence some 30 000 strong and could well hold their own, as proven for a long time with the European onslaught. 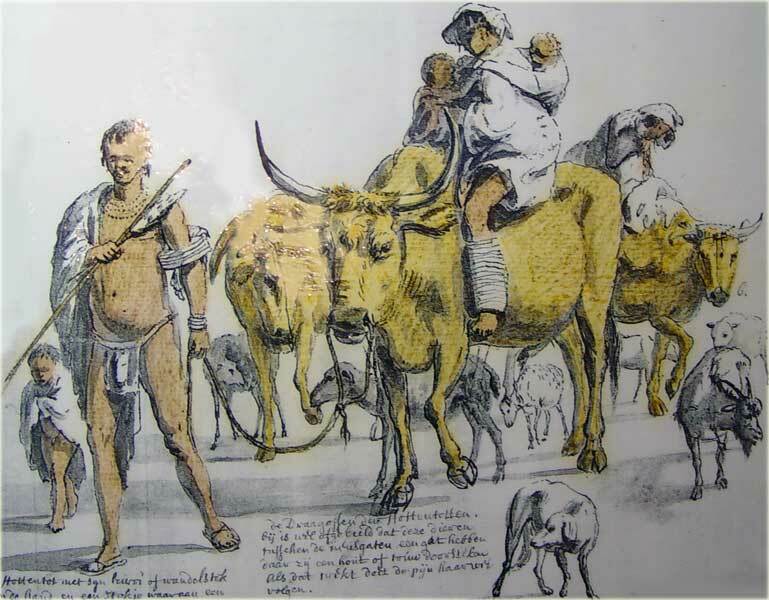 From the Zuurveld down to the Hottentots Holland Mountains the Khoena were well established numerically alongside Xhosa and fairly integrated with them, and had tens of thousands of head of cattle and sheep. At the time of the European invasions the Khoena numbers were fairly much on par with that of the Xhosa (if one looks at the comparisons in the first scientifically compile census of 1865 this is a strong indicator). There is no evidence of any sudden invasion by Nguni and no evidence of war and devastation among the Khoena at the hands of either the Nguni who were settled in the Eastern Cape long before van Riebeeck’s arrival , or by the older Xhosa of pre-Nguni times. There is however overwhelming evidence of sudden invasion, war, genocide and destruction by the Europeans and it is simply propaganda and wicked to suggest otherwise by equating a 1800 year slow migratory drift of people indigenous to the continent with an invading European colonial force. South Africans were subjected to great distortions around our history in school curricula dictated by the neo-fascist Christian National Education. The ‘GREAT LIE’ that was fed to school children and reinforced at tertiary education institutions for a long time basically said that at the time of the Europeans arrival in South Africa, it was a largely uninhabited land, sparsely occupied here and there by very primitive people – ‘noble savages’ (not quite human and not animal) who had no notion of ownership or claim to the land in which they wandered about largely living by their wits. This lie went on to say that foreign black hordes from the North arrived suddenly as colonisers more or less at the same time as the Europeans and ruthlessly started to take over the land of the wanderers and began to wipe them out. The few remnants of the wandering Khoena and the hunter-gatherer San, according to the ‘Great Lie’ succumbed to smallpox and then largely died out over time. The Great Lie then says that the survivors were given every assistance with the help of missionaries to embrace civilisation and lead wholesome lives. European civilisation in this dishonest story therefore saved the San and the Khoena from the destruction of the Blacks. The ‘Great Lie’ had its own contradictions but everything was done to indoctrinate people of colour in the Cape that their real oppressors and their enemy was a foreign black invading force and that the Europeans saved the surviving Khoena and San and gave them the means to develop and take their place alongside the civilised world. This process called ‘PACIFICATION’ of the Khoena was as bad, if not worse, than the brute force of the wars employed by the Europeans (15 wars of dispossession) to forcibly move the Khoena and take over their lands. ‘PACIFICATION’ also included destroying all forms of social organisation, institutions of leadership, alienation of San and Khoena from land, induction into servitude as servants and farm labourers, conscription into commando militias, engaging Khoena in crimes of genocide against the San, and indoctrination into Christianity. It was the European that criminally assaulted the Cape San, Cape Khoena and Eastern Cape Xhosa and not invading colonising black hordes. The impact of ‘ethnocide’ and ‘pacification’ was devastating and the Cape San and Cape Khoena too to some extent faced extinction had it not been for the assistance of others such as the Xhosa and Nama and northern San as well as for the phenomenon of slavery that allowed integration for survival. The Cape San who faced concerted genocide were driven to extinction. The few Cape San children who were not killed were taken as prisoners to become labourers on farms. They integrated with slaves and had offspring, which assisted a form of survival through natural assimilation. The more numerous Khoena though stripped of their social formations, leadership institutions and land followed five avenues for survival – seeking refuge and reintegration among the Nama and Korana (and to some extent with Xhosa); integrating and assimilating with slaves and forming a new labour forces of Khoena-Basters; congregating at mission sites and utilising a theology of liberation to counter pacification; allying in armed resistance with the Xhosa against colonialism and pacification ; and forming Oorlam, Griqua and other revivalist formations and strategies. The ‘GREAT LIE’ has been resilient and it still is quite dominant in all discourse regarding indigenous people. Key to understanding the experience and the grievances of surviving Indigenes lay in understanding what constitutes ‘colonialism’, ‘genocide’ and ‘ethnocide’ and not to go down the path of racist arguments about ‘Black Colonists’ that only serve to take the focus off the suppression and dispossession of Cape Indigene communities. What is Genocide and what is Ethnocide? Here academic researcher and writer Mohamed Adikari assists us. We must be cautious and focused when using terms lest we undermine our own arguments. When it is argued that both ‘black people’ and Europeans are responsible for colonising, dispossessing Khoena and San of their land and livelihoods and committing genocide a grave series of errors have occurred that only serve to let the European colonial perpetrators off the hook. We have already addressed the distortion on what is ‘colonialism’, here the issue of ‘Genocide’ and ‘Ethnocide’ is addressed with the assistance of Mohamed Adhikari’s work on this subject. Genocide is a Crime against Humanity committed with the intent to destroy in whole or in part, a national, ethnical, racial or religious group through a) killing members of the group; b) causing serious bodily or mental harm to members of the group; c) deliberately inflicting on the group conditions of life calculated to bring about its physical destruction in whole or in part; d) imposing measures intended to prevent births within the group; e) Forcibly transferring children of the group to another group. GENOCIDE: Adikhari outlines at least ten further definitions, but also provides a comprehensive understand of Genocide (and ethnocide) for the South African context in his work on the South African Genocide – The extermination of the Cape San Peoples, where ‘Genocide’ as ‘extermination’ is made clear. He defines ‘Genocide’ in the South African context “as the intentional physical destruction of a social group in its entirety, or the intentional annihilation of such a significant part of the group that it is no longer able to reproduce itself biologically or culturally, nor sustain an independent economic existence.” Adikhari goes on to say that “the ‘intent’ need not be explicitly declared (in our context there were times that it was explicitly declared and other times it was when Trekboer society and commandos just followed an exterminatory culture). He says “it is sufficient only that the perpetrators exhibit genocidal intent. Genocidal intent does not have to be present at the start of the violence as objectives can change during the course of an atrocity. Once the consequences of socially destructive actions – which can include conquest, land expropriation, massacre, forced labour, forced migration, the destruction of environmental resources, confiscation of food, the spread of disease and child removal – are recognised as possibly leading to extinction, to persist in these actions is to display genocidal intent” ….. and this Adikhari can lead to genocidal consequences. Now this can be argued as also being all experiences also shared by the Cape Khoena with some finer distinctions….. and most importantly it did not have the consequence of genocide with such intent. What the Cape Khoena experienced was forced removal, ethic clearing and the consequence of ethnocide. ETHNOCIDE: Adikhari states that “coerced cultural assimilation without extensive bloodshed (death on a scale large enough to debilitate the social life of the group in question) does not constitute ‘Genocide’. Ethonocide, crime against humanity and cultural suppression are more appropriate terms for this abuse. Mass displacement or deportation on its own does not amount to genocide – nether do conquest or suppression of revolt without genocidal intent”. The Khoena were not wiped out or exterminated and still exist in various formations today. The Cape San don’t. It is thus a very important distinction to make because if one does not make this distinction it can undermine the claims of both surviving Khoena communities and revivalist communities. Essentially from an original Cape San population of 30, 000 at the time of van Riebeeck, by the 1970s only 30 ‘unhybridised’ Cape San still survived according to Adikhari. He goes on to show that in South Africa today there are 7,500 people who identify as San. These are not the Cape San. About 1000 are Khomani and //Xegwi and, 6,000 are recent immigrants from Namibia and Southern Angola who were part of the SADF forces when it retreated from Angola and withdrew from Namibia in 1990. The Cape San were destroyed – eliminated or ‘exterminated’ and no other group including the Khoena suffered this atrocity. Very few people today can identify as Cape San. The survival of Cape San memory and genetic linkage largely only exists because of the assimilation of captive San children who had offspring with slaves and pacified Khoena on Cape farms. This heritage and memory survives within modern Khoena and those classified as ‘Coloured’. We should however be cautious of calling this Khoisan identity because that sanctions assimilation and to a degree violates the memory of a distinct Cape San people. It also papers over the violation and genocide of Cape San by pacified Cape Khoena commandos led by Europeans. The memory should always recognise Cape San and Cape Khoena as distinct groups with some common experiences and some common antiquity roots and dna. WHO ARE THE CAPE KHOENA PEOPLES? We have already looked at the Kalahari origins of the Khoena and the origins of the Cape Khoena flows from the understanding of those origins. By 200 – 300 AD the Khoena of the Kalahari and its perimeter had migrated down to the Gariep River territory where they co-existed with the Southern San. The Khoena formations that developed there were the NAMA who would move very slowly down a part of the West Coast and who would give birth to the GURIQUA clanlets which could be found in the Southwestern Cape at the time of colonization. Then there was also the ENIQUA of the Gariep; and the GORA of the Gariep, also known as the KORANA who lived alongside the various groups of San and there was a degree of integration. At the Gariep the KHOENA engaged with Tswana and Sotho, and also later at its lower reaches with amaXhosa and there too was a degree of integration and with mixed groups forming. Over the next 300 years through a process of ongoing social organisation through multiplication of tribes by division and ever moving southwards, the breakaways from the Gariep Khoena spread and new social formations were born – one giving birth to the other. East of the Gariep in the Eastern Cape the Chobuqua (Cobona) emerged with habitat around the area between Port St Johns and the Kei River and from here a break-away group of KHOENA gradually moved ever Southwards in a slow migratory drift down to the southwestern and central Cape where they entered the southernmost lands of the Cape San (or /Xam) people. Along this migratory route between 600 – 1000 AD the Khoena and San were joined by some of the earliest siNtu speaking migrants who had been part of a gradual southwards migratory drift from the Great Lakes region. This very small early Bantu migration along the eastern trajectory met the Khoena who had migrated from the Gariep. They also met the //Xegwi and !Kwi San who already had habitat before the Khoena arrival. This is how the original Xhosa formation came about – a coming together of San, Khoena and early Bantu (siNtu speakers). Those first Bantu could not have been a large invading group because the culture and language of these early Bantu was dramatically altered to reflect much of the Khoena and San culture and language which left its mark. Later Nguni arrivals would again stamp a stronger Nguni mark on the amaXhosa. In comparison, not much of a mark was left on the Khoena and San by the siNtu speakers language and culture. This is not the usual hallmark of a conquering people and suggests that at this time the Xhosa were not a dominant group. Later Nguni speakers who moved down from the area of what we call KZN today around the 14th century into the Eastern Cape and were more organised social formations with military capacity and in their areas of settlement they became a dominant force. The Nguni first dominated in the areas north of the Kei River (Zwede, Xesibe, Hlubi (southern), Bomvana, Mpondo, Mpondomise, and Thembu) and then later as these new Nguni influenced the earlier siNtu/Khoena who were living around the Kei – namely the Xhosa and Cobuqua, the territory from the Kei River down to the Gamtoos saw its own social revolution. THE SPREAD OF THE AMAXHOSA: In this social revolution with the influx of new siNtu Nguni groups, firstly the Xhosa and then Chobuqua it would seem, largely assimilated and over time became the Xhosa house of Phalo, which then split into the Gcaleka and Rharhabe houses (lineages and great chieftainships). Two dominant social formations in turn developed from the Rharhabe house – the Ngqika house born of Mlawu and, the Ndlambe regency (the regent for the young Ngqika who conflicted with him) and then there were also the Sigcawu formation. But south of these social formations were the older southernmost Xhosa formations who shared close and integrated familial and ancestral relations with the Khoena and San – the GQUNUKHWEBE – who by the time of the colonial assault were led by Chief Chungwe who was closely allied to the Khoena of the region – Hoengeyqua, Gonaqua, Gamtoos, Inqua and even the Attaqua. Peaceful coexistence was shattered for awhile as a result of the wrong alliances being made by particular Xhosa tribes and Khoena tribes against mutual enemies. This was highly influenced by the Nguni influence over the Xhosa, particularly the introduction of deference to royalty and the paying of tribute to kings. Pieres tells us that the Inqua chief Hinsati made the mistake of giving refuge to Xhosa royal Gwali, who was dethroned by his brother Mdange acting on behalf of Phalo. As a result of a war around this act the Inqua were defeated and were assimilated into the Sukwini, Gqwashu and Nkarwane clans. These three clans are part Xhosa and part Khoena. Similar stories relate to the Khoena incorporation or creation of the isiThathu, Ntinde, Giqua. The very name of the Gqunukhwebe for instance derives from the Khoena tribe known as the Gonaqua. Khoena, San and Xhosa internal conflicts spilled over into each other’s ever changing social formations. These inter-African tribal interactions and similar between the Xhosa and the San, which occur over a long period of time with different periods of intensity are a natural phenomenon in African social history that cannot be compared to the sudden colonial invasion with the intentional purpose of clearing areas for calculated deliberate European settlement. The Xhosa effectually when fully analaysed are a hybrid people of an early siNtu, Khoena, San and Nguni mix, with many having as much claim to Khoena and San ancestral heritage and culture as those trapped under the label ‘Coloured’. The Gqunukhwebe, Khoena-Xhosa mix were to become strongly influenced by the Ndlambe and particularly after the British crushing and murder of Chungwa. The catalyst for radical change of identities and power relations was first the relatively weak but very destructive Boer incursions, but more damaging was the powerful British military and social engineering interventions. The Khoena groups were one by one crushed and pacified by the European settlers but pockets of Rebels under the leadership of Chiefs Klaas and David Stuurman made an alliance with the Ndlambe Xhosa, in the form of a resistance confederacy and over more than three decades kept the combined struggle alive. Thus to this day there are Xhosa and Khoena Stuurmans. It is a complete fabrication that the Khoena and San were assaulted and crushed by a foreign invading hoard of blacks from the north. There is shred of evidence for this nonsense story. It is of interest to note that the dna make-up of Xhosa people in at least one large sample tested has been shown to reflect about 17% of the same Southern African dna demarcating San and Khoena dna as those classified as ‘Coloured’ who in the same large sample testing showed 30% having the Khoena and San dna markers. Notably the same tests showed those self-identifying as ‘Coloured’ also having 31% sub-Sharan dna (bantu). Thus large numbers of both those today called ‘Coloured’ and ‘Xhosa’ show descendancy from San and Khoena. NOTE 1: WHO ARE THE NGUNI? Around 600 AD, as a result of a different gradual but more substantial Bantu migratory drift into the areas of KZN where Tsonga from Mozambique came together with Bakoni from the western regions of South Africa and with the San, a further new South African born formation developed, referred to as the Nguni language group. They would later in time join the earlier siNtu speakers in the Eastern Cape through a slow migratory drift. This downward knock-on formations of locally born social organisations made its way into the north of the Eastern Cape and have already been mentioned – Zwede, Xesibe, Hlubi (southern), Bomvana, Mpondo, Mpondomise, and Thembu. The Nguni, who evolved in South Africa, were not a sudden invasion of Black colonist aliens that arrived one day to rob and, kill and plunder as some propagandists have elaborated. All of these groups mentioned evolved as a range of South African born formations. They were not a foreign invading force but an evolutionary trajectory born of the mixing of Bakoni (from Sotho/Tswana/Khoena from the West), San (East Coast San) and the southernmost Tsonga – namely the Tembe. It is this local mix that gave birth to what we call Nguni. The largest initial group of Nguni in the East were the Ndwandwe, which in turn and in time saw the emergence of social formations such as the Ngwane and the Mthethwa. It is from the latter that the original small tribe of Zulu emerged alongside the Khumalos, Qwabe, Hlubi, Bhaca, Bhele and Zizi. The Nguni to the North in what later became Swaziland were the Mbo and the Langeni subdivision that birthed the Dlaminis. Between 600 AD and 1500 AD this represented the emergence of modern social organisation in the Eastern regions of South Africa. Trading links prior to European colonisation ran from Mozambique right down the East Cost to the Southern Cape from one social formation to the other. NOTE 2: In the North Central and North Western parts of South Africa there are further complex histories of social formations which are also involving a mixing of peoples including Khoena and San starting from the periphery of the Kalahari. Moving from East to West is the story of the Venda and Pedi formations including the Phalaborwa, Lobedu and Shona as well as the fascinating ancient Lembe traders with their Middle-Eastern linkages, the Singo and Rozvi with their stone-walled towns, and the Kgalagari, Kalanga, Tswapong. Then there is the uSotho story and the baTswana stories of the Morolong, Masilo and Mokgatla and, the sub-divisions forming the Hurutshe and Kwena story. The Nguni formations of the Eastern Regions also would migrate westwards over time with the emergence of the Fokeng and from these arose those later became known as Matebele. Then there are the Tlokwa, Kgatla and Tlhaping who also came into conflict with the Gora or Korana. The Rolong story and their conflict with Kora (Gora) for instanced reached the ear of van Riebeeck when Kora traders who had come down to Cape Town to trade with the Dutch, that they were attacked by the Briqua (the Rolong). The social formations in this part of South Africa had many complexities which would ultimately impact of the Gariep communities and more intensely so when the combination of the European colonists embarked on their Great Trek, the Mfecane/Difecane occurred and the British conflict with the Boers took place. What is simply important to note here is that the population and its many social formations in this part of South Africa are as old as the migratory shift of Khoena moving southwards from the Gariep. The territory north of the Gariep and from the Kalahari perimeter to the East Coast and up to the Limpopo is vast – and there was no European dictated border of South Africa in those times that demarcated a Botswana, Zambia, Zimbabwe, Swaziland, Mozambique or Lesotho. In these territories and to their immediate north there are signs of great civilisations which at least in their beginnings are as old as the emergence of the Khoena and are linked to migratory drifts from the Great Lakes regions. All of these peoples consider themselves as indigenes of their region and indigenous Africans. The notions of ‘origins’, while of note, is actually not as clear and exclusive as some think nor is it the most important focus in the struggle for the rights of those Indigenous people who are most marginalised and discriminated against. The most important issue is what happened to the Cape San and the Cape Khoena under colonialism in terms of people, social organisation, leadership structures, land and resources and how subsequent to this the dominant forces in South African society has continued to marginalise and discriminate and deny the social history, culture, existence and rights of indigenes. That is the ral struggle to overcome, not the notion that some persons of colour are aliens compared to others. Don’t buy into this ‘divide and conquer’ lie. HOW MANY KHOENA EXISTED AT THE TIME THE TERM ‘COLOURED’ REPLACED OTHER TERMS? It is very difficult if not impossible to say how many persons among those labelled ‘Coloured’ have the right to be recognised as Khoena (Khoi) today. However we do have a clue as to what those numerical parameters may have been at the time of the beginning of the 20th century. In 1806 we find reference to around 18 000 Khoena/Baster Hottentots in the Cape Colony and their locations. In 1806 the population of the Cape Colony was 25 000 whites, 29 000 slaves, 1 200 Free Blacks and 18 000 ‘Hottentot-Basters’ of whom 500 were in Swellendam, 5000 in Stellenbosch and 8 947 in the Gamtoos and Graaff Reinet district of the Eastern Cape and the others were scattered across the long western frontier. This however reflected the boundaries of the Cape Colony at that time and did not include 10 000 – 15 000 Khoena in the Gariep district. Then in 1837 the Aborigine Protection Society references 33, 000 Khoena in a Report to the British Parliament. After this date, except for a very important document of 1865 the Khoena, Slaves, Prize Slaves and Free Blacks are recorded as ‘Coloureds’ – a catch-all term created by the British adminstration. However when the British carried out the very first Census done in modern scientific format in 1865 and presented it to Parliament in 1866 the administration temporarily reverted to separating ‘Hottentots’ (‘Baster-Hottentot’) from ‘Other’ – denoting other persons of colour and, two separate figures are given. This does not happen in later years. Between 1865 and 1904 migration of persons of colour increased from St Helena, Philippines, China, India, West Africa, the Caribbean and North America, but particularly from East Africa mostly as indentured labour to replace slavery. This substantially increased the ‘Other Coloured’ population by 1900. The African component, generally called Masbiekers were formally assimilated into the ‘Coloured’ population by the authorities in 1904 rather than ‘Native’ [Black] population). It would thus be fair to say that the ratio of Khoena to ‘Other persons of Colour’ designated as ‘Coloured’ was less than 1:2 or one third of the total number classified by the authorities as ‘Coloured’. The Khoena as a result of the 169 years of war was the only population (other than the San) that reduced in numbers (by three fifths) from their original numbers at the time of van Riebeeck. Europeans grew from 90 persons to 181 592 by 1865 and, Khoena from 200 000 persons reduced to 81 598 in 1865 of whom three quarters were likely to have mixed roots with slaves and others. Such was the effects of the crime of Ethnocide against the Khoena. WHO HAD HABITAT AND WHERE AT THE TIME OF COLONIAL INCURSION? As previously established a preferable and more accurate anchor in discussing the ‘land issue’ as regarding Indigenes (or indigenous people) is to examine who had habitat and where at the time of colonial incursion – ie ‘FIRST HABITAT’. Firstly in is important to dispel the falsehood that most of South Africa was uninhabited and that instead it had small groups of wandering people with no claim on land ownership. It is also important to distinguish between foreign visitation to the shores of South Africa via sea travel and the later colonisation (European settlement, dispossession of indigene land and resources, and subjugation) that took place. Seaborne visitors to the shores of South Africa can be traced in history over a long time. In pre-modern history Knox-Johnston, a maritime historian, indicates that the story of the visitors and migrants of colour to the Cape can possibly be first traced back to the Phoenicians (people of Lebanon, Syria and northern Palestine) 2,500 years ago, followed by the Carthegians 140 years later. Beale further shows that the ancient Buddhist temple at Borobudur has a bass relief showing a sailing vessel indicating a trip down the east coast of Africa by Indonesians around AD 700 and in 2003 he built a replica that successfully proved the possibility of rounding the Cape at that time. Knox-Johnston further shows that the Chinese travelled down the African coast in AD 960 and the Arabs may have reached as far as the Cape in AD 1000 and that their cartography fairly accurately identifies South Africa in 1154. These Arab travellers referred to the South African indigenes as Wak Waks, differentiating these from East and North East Africans whom they referred to as the Zanjis. Menzies, another maritime historian, further makes a strong case for the Chinese having rounded the Cape at least by 1421 when China circumnavigated the world. The Chinese cartography of this time was much more advanced than that of the late-comer Europeans and notes detail like the Drakensberg mountains. While it is important to acknowledge these external contacts, we have no records of that early engagement with indigenes, nor reliable information on the impacts that may have been left. But there must have been engagement and impact. In the modern period we know that according to maritime historians Gaastra and Bruijn, a huge build-up of shipping which stopped at the Cape, took place between 1600 and 1652 numbering some 1071 ships and then post 1652 the entire shipping trade mushroomed decade after decade. During those first 52 years of visitations, one can calculate around 200,000 passengers passing the Cape on outward bound journeys and at least half that number on return voyages. For various reasons, among the crews and passengers were people of colour – most notably slaves from West Africa taken to Southeast Asia and from Southeast Asia and East Africa on westward bound journeys. During this time there is record that some indigenes that had travelled abroad to London, Java and Batavia as shown by Elphick and others. Social historians Crampton and Vernon show that evidence exists that people of colour as well as Europeans were shipwrecked, made it to shore, became accidental settlers and assimilated into indigene populations. Vernon chronicles many of these earliest shipwreck survivor stories from the 16th century in some detail too. According to SA Tourism, there were over 3000 ships of 37 nations that were wrecked off the South African coast since the 16th century. In the years before the European settlement of 1652 most of the survivors of those wrecks assimilated into local indigene African communities and these will have made impacts in pre-colonial settings. As a result of records provided as a result of pre-colonial visitation to our shores from the early 15th through to the 17th century we are able to get a fair idea of the state of habitation in the two and a half centuries before colonisation. Archaeology also gives us an even older idea on spread of habitation, social organisation and mode of living. The information at hand more than dispels the myths perpetuated in the ‘GREAT LIE’. The information available shows that the Cape Khoena and their Southeastern Cape siNtu cousins, the amaXhosa, and the earliest of inhabitants, the Cape San (/Xam and !Kwi) had first habitat of the Eastern Cape from as early as between 500 – 800 AD and were certainly well settled far down into the Western Cape and on the Cape Peninsula for over 800 years before European colonists established their first settlement at Table Bay. By 1400 the Northern reaches of the Eastern Cape also had newer siNtu speaking migrants who had moved down in a gradual drift, in a social-organisation multiplication by division process over time from the area we today call KZN – namely the amaPondo, AbeThembu, and amaMpondomise who on arrival interact with the settled Khoena, San and amXhosa and the mixed community of Cobuqua. At the time of European ‘first incursion’, the San and the Khoena (Khoi) shared first habitat in the Cape from the South-eastern Cape down to the Cape Peninsula and throughout the Western Cape up to the Gariep River. In the Southeastern Cape both groups also shared that habitat with the siNtu (amaXhosa) with whom they shared ancestral and familial relations for 800 years prior to the later Nguni migrations from the north, of amaPondo, AbeThembu, and amaMpondomise from around the 14th century. Evidence is that these different peoples co-existed in the same habitat, with the Khoena being more numerous in the area from the Zuurveld right down into the Overberg, with smaller groups living right down into the Cape Peninsula. Strictly speaking the San had “first habitat” in the Northern and South-Central Cape and were known as the /Xam and on the Eastern Coast they were known as the !Kwi. Both the Khoena and the siNtu migrated into the terrain of the Cape San but this cannot be equated with colonisation and acts of war and extermination, though a degree of natural low level friction arose from time to time between pastoralists and hunter-gathers. There are no markers evidencing large scale or mass aggression. There is no doubt whatsoever that on the Cape Peninsula and environs the Khoena social formations who had ‘First Habitat’ at the time of colonisation were the Cochouqua, Gorachouqua, Goringhaiqua and Goringhaicona. These social formations shared soft boundaries with the Chainouqua, Hessequa and Attaqua in what was to be later named the Graaff Reinet district bordering the Zuurveld and the Swellendam District below. It is this “First Habitation” at the time of colonialist occupation that is the basis of the assertion that in the different areas south of the Zuurveld and inland up to the Gariep as explained, the Cape San and the Cape Khoena were the ‘indigenous people’ or ‘indigenes’, and in other areas the the siNtu-Khoena, the amaXhosa, the AbeThembu, amaPondo and amaMpondomise were also indigenes. On the Western Coast and inland up to the Gariep were the Nama Khoena and their sub-clans the Guriqua. The largest numbers of Khoena were concentrate in the Swellendam, Graaff Reinet and Zuurveld districts in the East and also the Namaqua in the West. Later we can be more specific about the demarcated habitat in the Cape Peninsula and environs. There is no doubt that at the time of Jan van Riebeeck’s settlement of United Dutch East India Company (VOC) officials there was a sound territorial claim by a network of indigene peoples starting with the Cape Khoena and Cape San from the Cape Peninsula to the Gariep River and stretching from the West Coast to the East Coast and way up the East Coast to the territory of the lower eastern Gariep. LAND OWNERSHIP AS A MATTER OF INTERNATIONAL LAW: Did the Khoena make it known that they lay claim to the land, as in the manner that Europeans thought of as ‘land ownership’? Contrary to those that propagate that the Khoena did not have a way of thinking regarding land ownership, or that this would be difficult to prove in law, the recorded facts say differently. This can be seen from the pen of Jan van Riebeeck himself. One needs to look at just one excerpt from the diaries of Jan van Riebeeck which sums up the feelings of the Khoena at the time and set the edges of the relations for the next 160 years. This excerpt is just after the pressurised signing of the ‘peace treaty’ after the second of 15 Khoena-Dutch wars. “They (the Khoena), strongly insisted that we had been appropriating more and more of their land, which had been theirs all these centuries, and on which they had been accustomed to let their cattle graze, etc. They asked if they would be allowed to do such a thing supposing they went to Holland, and they added (in their own words): ‘It would be of little consequence if you people stayed here at the fort, but you come right into the interior and select the best land for yourselves, without even asking whether we mind or whether it will cause us any inconvenience’. Were the Khoena entirely nomadic? No! This is another European myth based on their lack of understanding about sustainable African farming science. Evidence of villages exist in European texts since the conflictual engagement between Franscisco d’Almeida in 1510. The Camissa trading and maritime settlement co-established between indigenes and the English prior to the VOC settlement also clearly demonstrates settlement rather than ‘beach-combing’. The accounts of the strength of cattle and sheep farming and the grazing patterns linked to seasonal and weather conditions illustrate sustainable herding rather than lack of settlement. Jan van Riebeek’s own journal accounts underline a relatively settled system of social organisation and habitat existed over centuries. Size of livestock herds which number in tens of thousands over a widespread area totally undermine the notion of pastoralism being simply a nomadic scavenging way of life. A History of the Upper Guinea Coast, 1545 to 1800. Walter Rodney; New York; Monthly Review Press. (1970) Read with – The History of Trade.